It was a collaboration with Aberdeen People's Press and was launched as part of an Edinburgh Festival Fringe programme at The First of May bookshop. Dave Francis, then manager at APP, worked on the project. Our paths now cross again as I encounter his work as a singer and storyteller. 'Ian Stephen has produced a first book of short stories about Stornoway, Living At The Edge. They remind me – and this is a complement indeed – of James Kelman’s dry laid-back style of talking through an almost insignificant event so that something is teased-out – a mood, a regret. It’s different from the Maclaverty technique of revealing the unordinary in the ordinary in that there’s a unifying aim of defining the author’s apartness, in the way Camus did in The Outsider. Again the title – Living At The Edge – it’s not just living where the islands become Atlantic and the edge of the Arctic, more a state of mind, a deliberate disengagement from current values…. Douglas Gifford (above) and others reviewed the book very favourably. It was soon out of print but kindled an enduring interest in the book as an object in its own right, where design, illustration and materials are integral. Many of the stories in the book were remade during my RLS residency at Grez sur Loing in 1995. By that time, I was engaged with many collaborations fostered by Alec Finlay of Morning Star Publications. These included two booklets with illustrations by Will MacLean as part of the Morning Star Folios series. A Morning Star booklet of my poems and black and white photographs worked as a catalogue for an exhibition, with the painter David Greenall, which was partnered by an Lanntair with The City Arts Centre, Edinburgh. 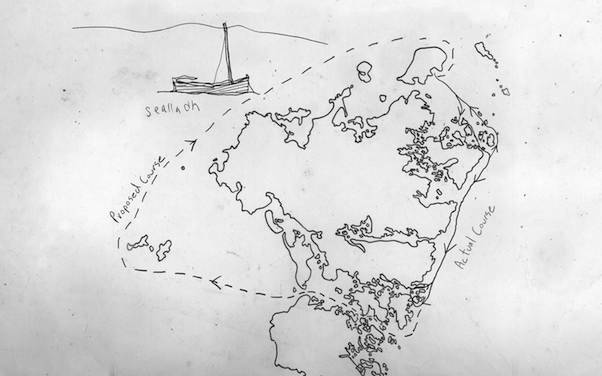 A drawing by David was included in the publication, Broad Bay. Alec also published my work regularly in the pocketbooks/polygon series. There were many anthologies. The first was published to co-incide with the touring exhibition Green Waters. This was mainly the work of three artists, all crazy about boats : Ian Hamilton Finlay, Graham Rich and Ian Stephen, with some other guest appearances. My collection of short stories was published, along with my own recipe-poems, guest recipes (including one by the artist/chef Donald Urquhart) and illustrations derived from education projects as Mackerel and Creamola. The pocketbooks series made a bridge between the limited edition small press editions and titles which found a more mainstream distribution. All the pocketbook titles are now also out of print. Through Alec, I met the artist David Connearn who invited me to collaborate on the opening exhibition of the restored Highland Printmakers gallery in Inverness, renamed Art TM. I was invited to compose two texts to a format which would work between three drawings. The work was made in several formats including a limited edition publication. Time & Tide was printed offset litho on chart-paper using magenta ink as supplied to the UK Hydrographic Dept. for Adrmiralty charts to reproduce the symbol for a pilot station. The envelope folio was printed letterpress in Perpetua by Colin Sackett. Onshore Offfshore was a balancing collaboration where I invited David to make 2 drawings to fit between 3 poems. It was published by Taigh Chearsabhagh to co-incide with an invitation to show work in a small poetry gallery in Helsinki. That experience was vital to a later production, published by an Tobar, to accompany a performance and exhibition derived from working with the inshore fishing community of Mull and Iona for a couple of months. These went on to Celtic Connections. Inshore, pink and black was a folded replica of a fathoms chart, with interventions, printed to continue the style of the previous publications. It contained a CD of a performance, with music, based on poems made from the fisherfolk's conversation. All three works were shown at Joyce Laing's gallery in a historic building in Pittenweem, as part of the Pittenweem Art Festival, along with selected three dimensional works from the an Tobar/Celtic Connections exhibition. confluence is the title of a publication linked to a work public work commission at Taigh Chearsabhagh, Lochmaddy. 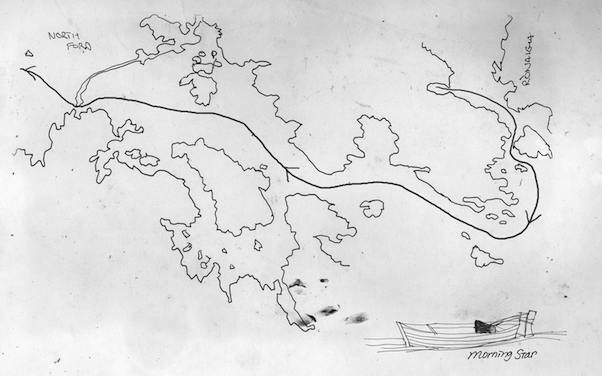 Three voyages in community owned vessels navigated routes suggested by three Gaelic songs. Three pages from the logbook have been re-made in slate, in collaboration with Saki Satom, and installed at an exterior walkway at the arts centre. 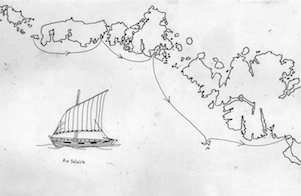 In 2007 3 routes suggested by 3 Gaelic songs, all written or recorded in the Uists, Outer Hebrides, were navigated by 3 different vessels, all in community ownership. A patent mechanical log was trailed behind each vessel to record the total nautical miles, covered, to sail through the songs. This is now installed in Taigh Chearsabhgh. A logbook was made, collating responses to the voyages, by those aboard. hearting is the material used to pack between the two joined walls which comprise a drystone dyke. I chose the word as a title for a small publication, made in collaboration with Caroline Dear, my partner in an interpretation project to celebrate restoration of a dyke and access to Uig woods, Isle of Skye. Phrases were engraved into slate slabs incorporated into the rebuilt dyke. Collaboration with Christine Morrison in a multi-arts project with an educational basis, led to the making of Acts of Trust. This project won the multi-arts section for the first BASE Awards (British Awards for Storytelling Excellence). Christine proposed blind drawing with pupils of different age groups as a parallel to the act of trust in telling a story without a text. Selected blind drawings from the project were then printed using the photo-gravure process. Ian composed a short verse form of the 3 stories used in the project. these were printed to accompany the drawings. Christine's printing process, made at highland Print Studio under guidance by John McNaught, combined intaglio and relief printing in a technically challenging combination. An edition of 2 was made and bound, in Japanese stitched style. The work has been widely exhibited and one copy is now in the collection of the V and A Scotland. Given sufficient demand the artists would make a second small edition, bound in oxhide to nod to the story of the bag of winds, from Homer's Odyssey. sea journeys, island hopping and trans-oceanic concepts is an ongoing project curated by Imi Haufe and Rona Rangsch. Invited artists (18) contributed an edition of 50 prints, on a maritime theme, to fit inside a case. This collaboration was first shown in Künstlerhaus Dortmund, Germany, 2013. Thus its tour began in a landlocked city. Since then, the work has been exhibited in many galleries and libraries in Europe and the USA. Voyage has been bought by private collectors and is held in several public collections. 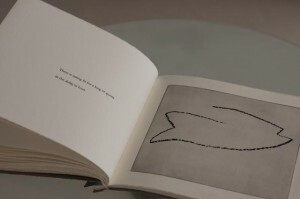 Stephen | Morrison contributed a print in photo-gravure based on the international symbol for a vessel 'Restricted in its ability to manoeuvre' as quickly sketched in a logbook. I've often referred to this as a metaphor for a storyteller, passing on inherited narratives. There seems to me to be a duty of care to the sources. Of course the story must be told in your own voice but it also seems to me vital that the inherited narrative is not altered, just to make it more comfortable.